Riders choose Florey Insurance for the extensive coverages we have with our companies and competitive rates. The companies snowmobile insurance coverage options include Bodily Injury and Property Damage Liability, Comprehensive & Collision, Uninsured/Underinsured Motorist, Roadside Assistance, and more. If you’re thinking about snowmobile insurance to protect you during your snowy adventures, we can help. Only 31 states have this coverage and luckily Pennsylvania is one. 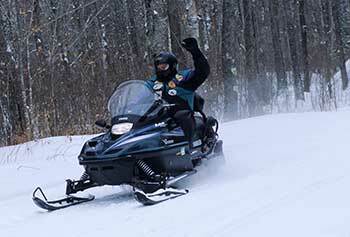 You can insure up to five operators and up to four snowmobiles per policy. You and your family can feel comfortable knowing snowmobile insurance is protecting you. And with a snowmobile insurance policy, you can insure just your snowmobile—no need to add it to a car or motorcycle policy. Selecting the right snowmobile insurance policy is just as important as choosing the right automobile insurance for your needs. A snowmobile insurance quote will show you exactly what kind of coverage we offer for your snowmobile. Get yours today! Florey Insurance found the best policy for me. Other companies wanted ridiculous amounts to have my teenage son covered.